Are you a fan of automotive history? Well Porsche is too. In fact, the German sportscar manufacturer has some rather special plans to mark the 60th anniversary of the first two Porsche clubs ever created. The first club began its humble beginnings in Westphalia, Germany back in 1952 — boasting only seven members — while the second was formed later that year in Berlin with only six members on their sheet. Flash forward 60 years and these two organizations have multiplied into 640 Porsche clubs scattered across 75 countries with over 180,000 members among them. To honor the company’s worldwide club members and enthusiasts, Porsche has created the 911 Club Coupe. Based on the Carrera S — and adding some performance tweaks throughout — the 911 Club Coupe receives an additional 30 horsepower boost to its powertrain bringing the total to 430, while boasting a 0-62 mph time of 4.0 seconds with a maximum torque output of 324 ft-lb. Performance options include Porsche’s Active Suspension Management which features an electronically controlled dampening system that drops the car’s suspension by 20 millimeters over its 20-inch Sport Tehno rims, with the standard Sport Design package adding a new and distinct front fascia and classic “ducktail” spoiler. 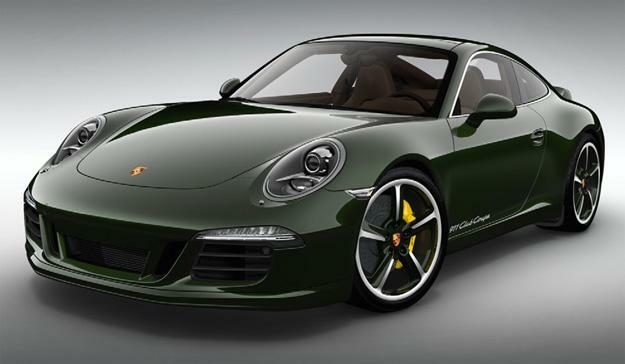 The entire creation is then finished off in Brewster Green, which Porsche describes as a “tribute to the typical color of the Porsche family cars,” and corresponding “911 Club Coupe” lettering on the car’s doors. The only caveat to all this German made wonderment is this: Porsche is only making 13 examples. That number drops to 12 as the German marquee will be holding onto one for itself. That leaves only 12 examples for the 180,000 members worldwide. But that’s not the end of it: If you’re seriously considering nabbing one of these rare Porsches you’ll have to register at the 911 Club Coupe microsite and win the allotment lottery. Registration ends June 16 with the winners given a stab at owning their very own piece of Porsche history – assuming you can foot the $175,580 sticker price.